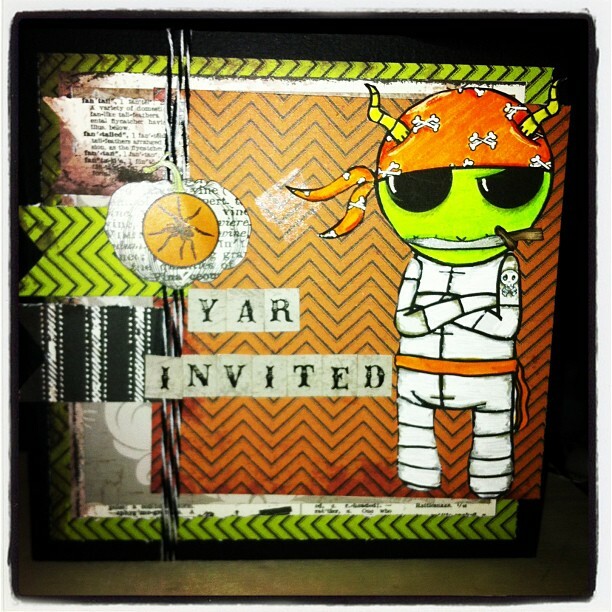 Queen Kat Designs: Yar Invited!!!!! Happy Wednesday everyone Janie here. Today I am going to show you a very interesting Pirate themed invitation I made. I have the honor of working with We Are Pirates-Demon by Kristie Silva and what a little character he is. I had to do a double take with him because I thought he was a mummy at first. Well low and behold he is a demon pirate and he is darling. I used one of my favorite collections on is card I used Echo Park's Chillingsworth on this card and I think it really brings out the image. I used copics and smooch ink on the image. LOVE this image! Great card, Janie! 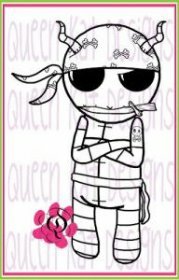 LOL this is just great - love the little fellow with "attitude" and love the colours you used! Janie, this card is awesome!